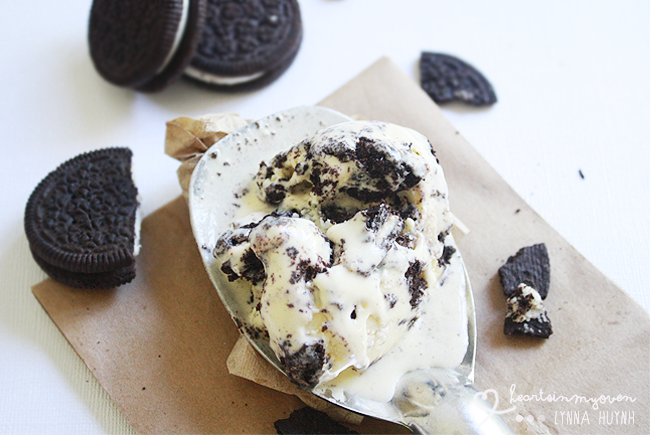 Today I share with you this super creamy cookies and cream ice cream recipe. This one is thicker in creaminess compared to the first recipe I shared with you on Monday. It`s prefect for the recipe I`ll be sharing tomorrow~ so keep staying tuned! Since summer is coming to an end and I`m not sure if the weather is still hot where you are...but here, in Southern California, it`s still very hot. This is way I need lots of ice cream! You want this ice cream too! You just don`t know it yet. I loved it and I`m terribly sad it`s all gone. 1. If your ice cream machine bowl needs to be frozen ahead of time, prepare so. 2. In a large bowl, pour the 3/4 cup heavy cream into it. Then, set a fine mesh sieve over the top and set bowl aside. 3. In another large bowl, combine the egg yolks and 1/4 cup of sugar and set this aside as well. 4. In a medium saucepan, heat the 1/2 cup sugar, 1 1/4 cup heavy cream, milk, and salt over medium heat. 5. When the cream mixture begins to simmer, add some of the cream mixture into the egg mixture while constantly whisking. Then, pour the rest back into the saucepan. 6. Continue heating the mixture, while constantly stirring, until mixture thickens and coats the back of a wooden spoon. 7. Transfer the mixture into the large bowl through the fine mesh sieve. Then, stir to combine. 8. Add the vanilla extract and combine. 9. Let the mixture cool before covering the bowl with saran wrap (making sure wrap touches the surface of the mixture to prevent film from forming). 10. Refrigerate until mixture is completely cold, preferably overnight. 11. Follow your ice cream machine's manufacturer's instructions to churn ice cream. 12. Transfer into container and freeze for at least 4 hours, or until desired consistency. The ice cream looks perfectly creamy and so delicious! I love oreos.. so I know I'm going to try this soon! Cookies and cream ice cream is my favorite! How fun to make your own. My girls will love this! I`m sure they will! :) Oreos are loved by all ages! OMG!!! I can`t wait to see delicious ice cream recipes from your blog now! You won`t be disappointed! Why thank you! :D Hope you`ll like it! You are really not just a food blogger, we think that you are a professional food photographer. Why don't you submit yours and make other people hungry. Thanks! I will look into it! 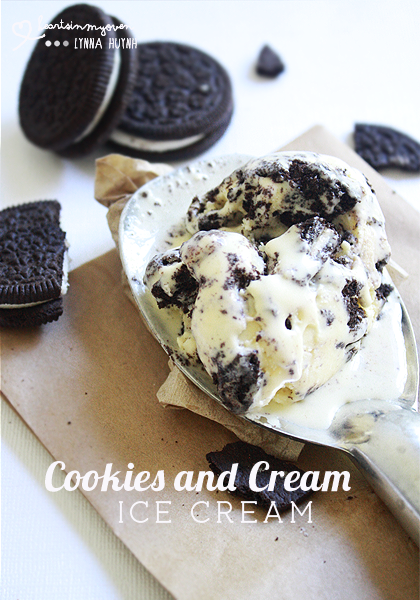 Amazing Idea...what a gorgeous recipe for easy instant ice-cream with oreos...and I'm a creamy lover too. I've once tried to prepare cherry ice-cream, but the recipe worked at all. I will try this recipe soon...sounds so easy and simple! There are lots of great choices now when it comes on Ovens You can ask for a professional guide when selecting one that would fit to your needs.